MENLO PARK, Calif., Jan. 18, 2018 /PRNewswire/ -- Workers may be thinking "new year, new job," according to a survey from staffing firm Accountemps. Approximately three in 10 (29 percent) professionals plan to look for a new position in the next 12 months. And of the 27 markets surveyed, Los Angeles (40 percent); Austin, Texas (38 percent); and Dallas (37 percent) topped the list of U.S. cities with the most workers planning to find new opportunities. Resume length is less important. Almost half (46 percent) of senior managers prefer a one-page resume for staff-level candidates, and nearly an equal number (47 percent) believe two pages is an ideal length. Ten years ago, managers were more likely to want just one page. For executive roles, half of managers (50 percent) cited two pages as acceptable, while 21 percent were most receptive to one page. The resume isn't the only thing employers consider when evaluating potential hires. More than half (56 percent) of managers said the candidate's online profile is equally important. Follow-up is expected and appreciated. All HR managers surveyed encourage candidates to check in after submitting a job application. Eight in 10 (80 percent) respondents said they take thank-you messages into account when deciding who to hire, but HR managers reported receiving notes from only 24 percent of applicants. The survey also found email is the most common way to stay in touch and send thank-you's. While following up is key, 33 percent of HR managers said they have removed a candidate from consideration because they were too pushy after an interview. 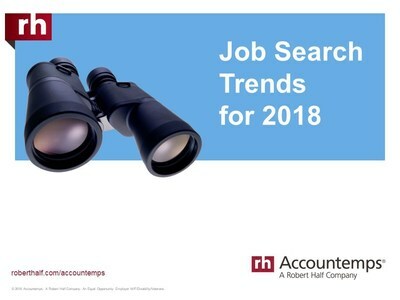 View a slideshow of the city rankings and job search survey results: https://www.slideshare.net/roberthalf/job-search-trends-for-2018/roberthalf/job-search-trends-for-2018. "The employment market is favorable for job seekers right now, but candidates still need to put their best foot forward," said Michael Steinitz, executive director for Accountemps. "While some aspects of the job search have changed over time, others are timeless, like having a concise and compelling resume, following up with employers after applying for a job, and sending a thank-you note after an interview." Take stock of your successes. List your accomplishments to help you update your resume and prepare for interviews. Be ready to explain your most important career achievements with specific examples. Check your online presence. Review your social media accounts to ensure they cast you in a favorable light. Keep your online profile up to date, noting key accomplishments at your current and previous jobs. Tailor the resume to the position and employer. Describe your skills and experience in relation to the job opportunity. Detail significant contributions you've made at your current or former employer and how they impacted the department or company's bottom line. Follow up throughout the application process. Always follow up with a thank-you note immediately after the interview. It's also okay to send a quick email to the hiring manager one to two weeks after submitting your resume or interviewing if you have not heard anything, but keep follow-up communication to a minimum. You don't want to be perceived as pushy. Know what you're worth. Many companies are wooing in-demand candidates with higher pay and other benefits. Use resources like the Robert Half Salary Guides to determine a starting compensation range for your desired position in your local market. Partner with a specialized recruiter. Work with a staffing firm to uncover opportunities that match your skill set. Consider temporary work to learn which industries and work environments suit you or get your foot in the door at a company that interests you. More tips about conducting a job search can be found on the Robert Half blog. The surveys of workers, senior managers and HR managers were developed by Accountemps. They were conducted by independent research firms and include responses from more than 2,700 workers across 27 major U.S. cities and more than 300 senior managers and 300 HR managers at companies with 20 or more employees in the United States.